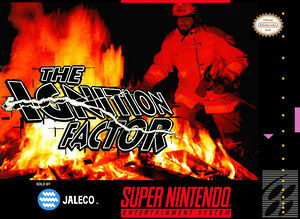 In The Ignition Factor take control of a brave firefighter as he battles to save people from towering infernos and flame-filled factories. You have a large variety of equipment to help you with your task. The hero isn’t afraid to get physical by kicking objects, climbing ropes and jumping in order to get to all areas. But time works against you as the fires get gradually worse and you run out of breathable air. Different types of fire need to be extinguished using different methods, so you’ll need to use your equipment to the best of your ability. Enlist the help of the fire engine and your fellow firefighters to extinguish all the flames you can see. Can you keep your cool and save everyone in a constantly changing environment? The graph below charts the compatibility with The Ignition Factor since Dolphin's 2.0 release, listing revisions only where a compatibility change occurred. This page was last edited on 31 December 2017, at 04:21.